One of my favorite things about my job is coloring. 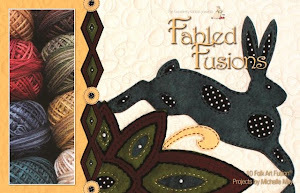 Now I don't color with crayons and pencils like I did as a kid, instead I use fabrics and threads to create a new story line and inspire new designs. As I have shared before, my days of interior decorating will always be with me. 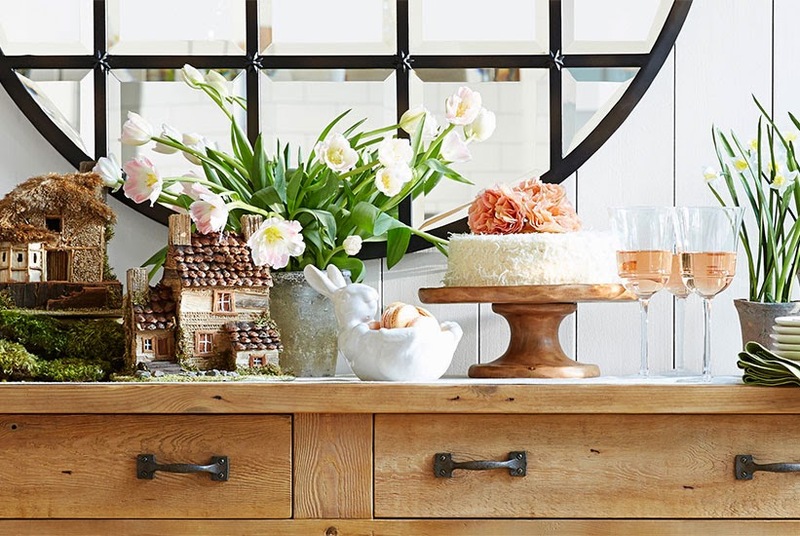 I tend to be inspired by looking at photos of houses and decorating more than anything else. 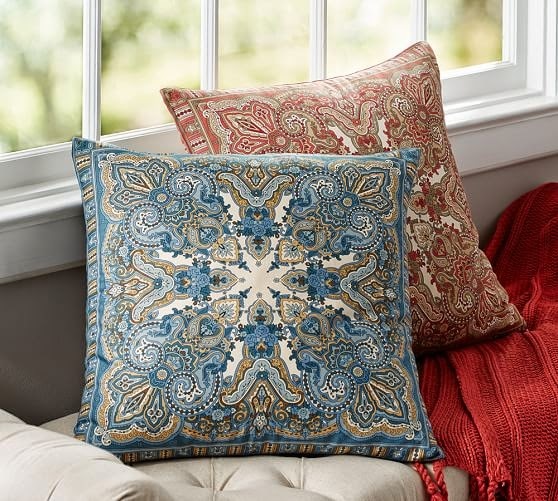 When I would help my clients decorate, I would have them bring me pillows, magazine images, paintings or a piece of fabric they loved. We would use these as a jumping off point to decorate their homes. My eye still operates this way when I design my Folk Art Fusion pieces. The other day I received the newest copy of the Pottery Barn catalog. 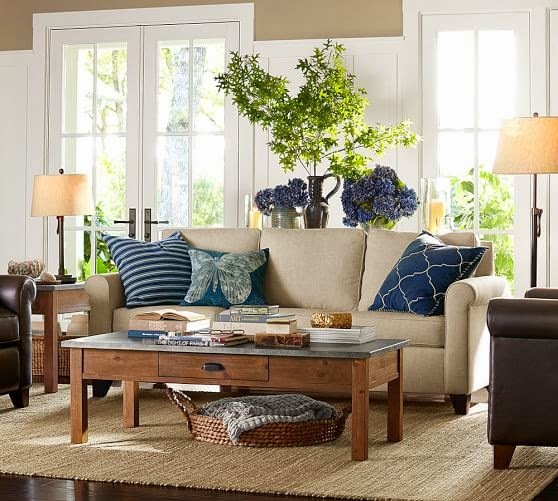 I admit that I love the Pottery Barn style. It's crisp, clean and casual. I always feel like I could walk into one of the photos and be right at home. 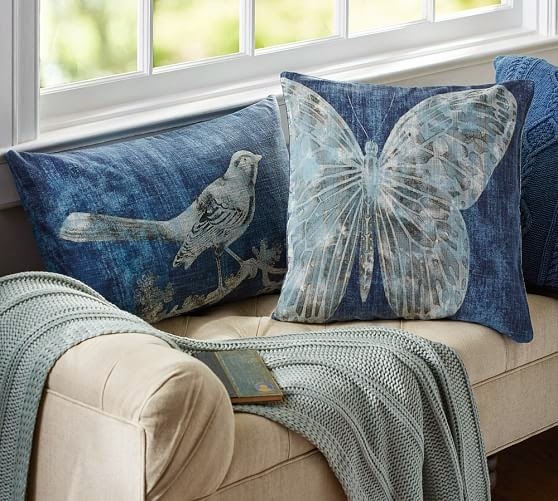 This season, the new color trend is Indigo. Woo hoo! I love this color. It's probably because I wear some form of blue jeans every single day. My friends laugh because my wardrobe consists of various lengths of jeans, such as jean shorts for summer, jean capris for spring and fall and regular jeans for winter. Hee,hee,hee. 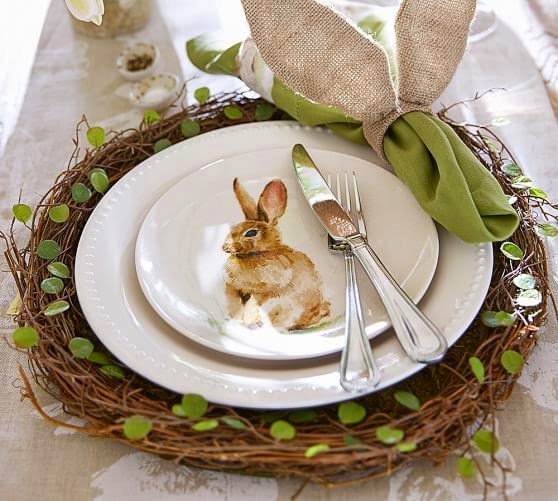 The catalog also showed some wonderful tabletop designs for Easter. I'm sure you know why I was drawn to this photo, but I also loved the browns, greens, creams and silver colors together. Plus, I love the mix of textures. 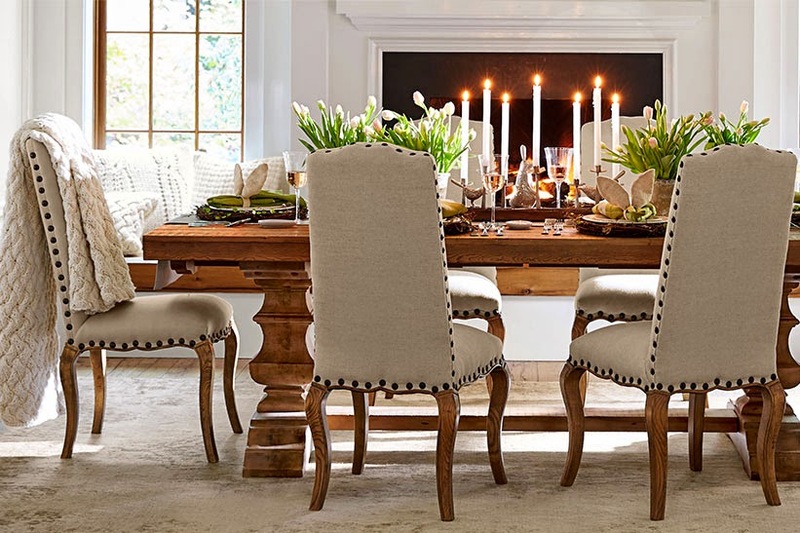 In this photo, I was drawn to the linen color of the chairs with the black nail head detail against the warmth of the wood. 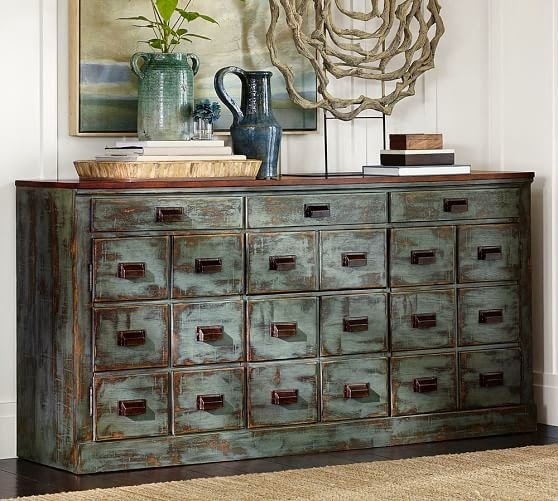 This is actually a piece of furniture I would love to purchase for my foyer. I love this piece so much. I'm drawn to the wonderful combination of black, blue and brown. In this photo, I also love how it looks with the off white walls, the dark floor and the soft tan of the rug. Oh and the soft grays in the driftwood art piece. Fabulous! So, after drooling over all the yummy goodies in the catalog, I tore out some of my favorite pages and taped them to the cabinet in my office. Then I gathered my wool swatches and Valdani threads and started to play. I would also like to invite you to hop over and visit my friend, Lucy Galgano of By Your Hands. I will be a guest on her blog tomorrow (Friday). Thanks so much Lucy! Hi ya! How was your weekend and your Monday? I was busy in Bunnyville working on some new designs and then catching up on paperwork. Last Tuesday was my monthly guild meeting. We only had a few show and tells. I think the gals were still recuperating from Christmas. We did have six new people visit though! It was wonderful and I hope they decide to join us. Holly also shared this quilt she won in a raffle from the mayor. I love the colors. She had her picture taken with the mayor when she won the quilt. As the photographer was getting ready to take the photo, Holly exclaimed, "Oh look, I'm under the cover with the Mayor!" She is a total riot! The Mayor got a good laugh too. Holly shared the tag with me. The quilt was handmade by a local lady. She has a little business making quilts to help support her family. Awesome! Our lovely "Fashionista" Marlys, who is Holly's mom in law, has returned from Minnesota. She spends her winters here in NC and are we ever glad she does! She modeled her beautiful jacket for us. She also knitted the scarf. Then Marlys showed us these faaaaaaaabulous minky infinity scarves she made. She told us that all the girls in the family got them as Christmas gifts. Can we say LUCKY!!! :) Have you ever felt minky? It is the softest stuff ever. Like a bunny!!! Holly received a red one, which I know looks beautiful on her with her strawberry blonde hair. She found the little basket in a shop and decided the chicken needed it to roost in. She keeps all her little notions in the basket. I love it. Pam shared this wonderful table runner. I love the striped binding. Gerri shared this beautiful piece she made which will be part of our guild display at the local library. For the life of me, I can't remember the name of pattern. It's a gorgeous quilt and it has something to do with pottery. Wedgewood...something maybe? My mind just went totally blank. Then Vicky shared these fun patterns which were designed especially for a local quilt fabric/home decor store, The Quilted Butterfly. It's really cool how these are put together. NO SEWING! It comes with a board that is like a self healing mat. You simply press the fabrics into the cracks of the board and then the board cracks close up and trap the fabric in place. I can't wait to see how these look finished. Finally, here is a sneaky peeky of my February Blessing of the Month. The pattern and a complete kit will be available on February 5th so stay tuned! Ok, off to finish some paperwork. Have a fun day and we'll see you back here Thursday. 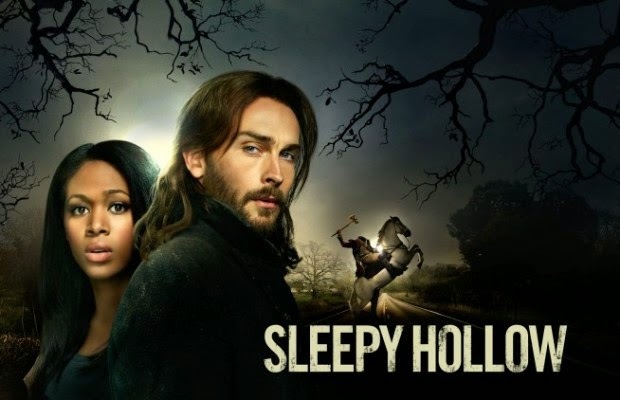 Have you seen the TV show Sleepy Hollow? 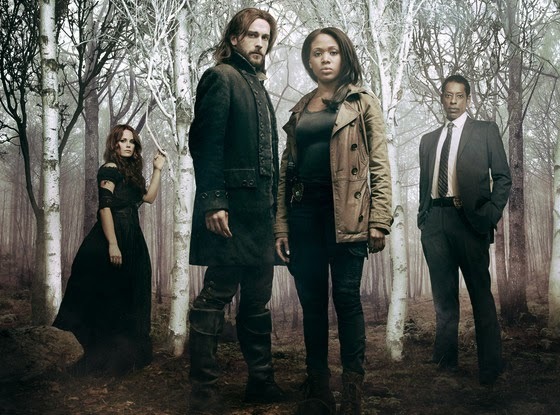 David and I love the show and look forward to each episode. Well, the other day I got to do something really fun! You see, they were filming in my town! 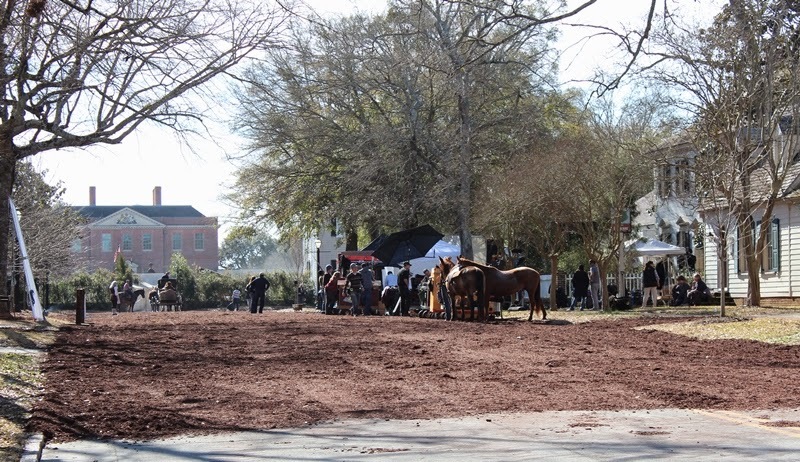 Yep, they were here in downtown New Bern to film the season finale. I only live five minutes from downtown, so I decided to hop on over and take a peek. I love all the creative magic that goes into making a show. It was really cool to see how they transformed paved streets to dirt streets with $100,000 worth of mulch! They took down street signs and covered up fire hydrants with bushes in order to make everything look really old. New Bern was originally the capitol of North Carolina and Tryon Palace was the governor's house. I peeked through the gates to see the scenes. I would love a job as a set or costume assistant. I always thought it would have been fun to go to college to learn something like that. Then I walked down the street to where the cast trailers were. 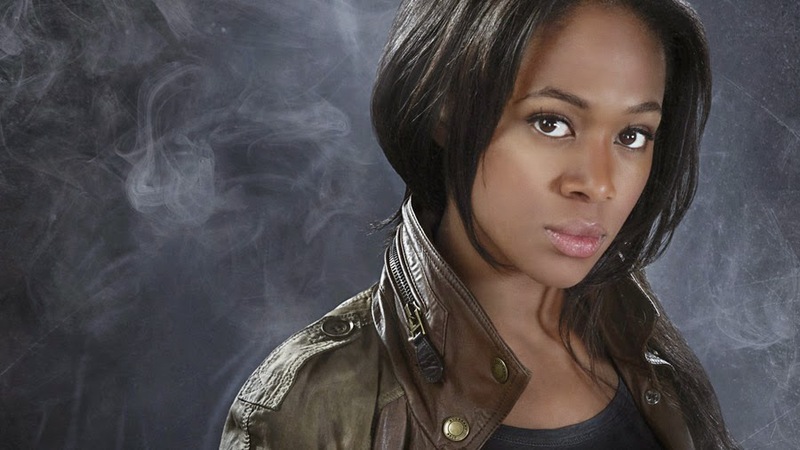 Here I saw Katia Winter who plays Katrina Crane. She had just finished a scene and was walking her little baby. Here she is leaving. I knew right away she was a kind person because she was so good to her little dog. 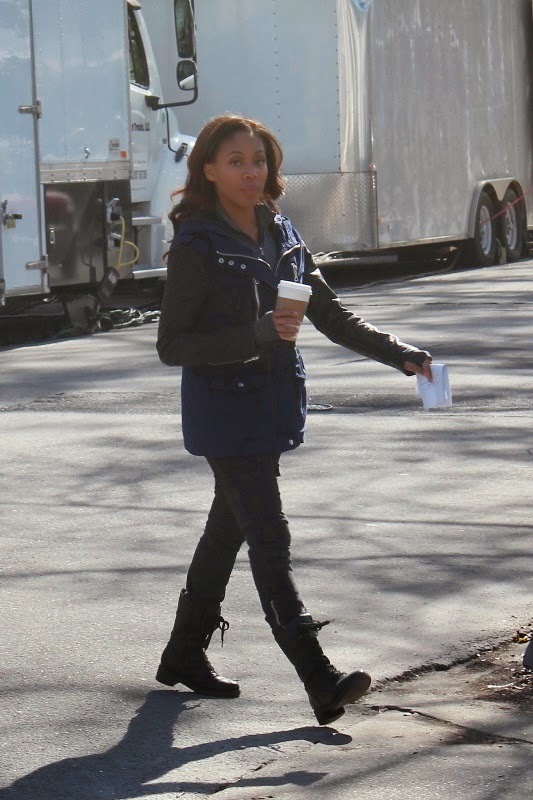 The next thing I knew, Nicole Beharie, the lead actress who plays Lt. Abbie Mills, came walking by drinking her coffee. She is a beautiful lady and is super tiny. She too had just finished a scene. 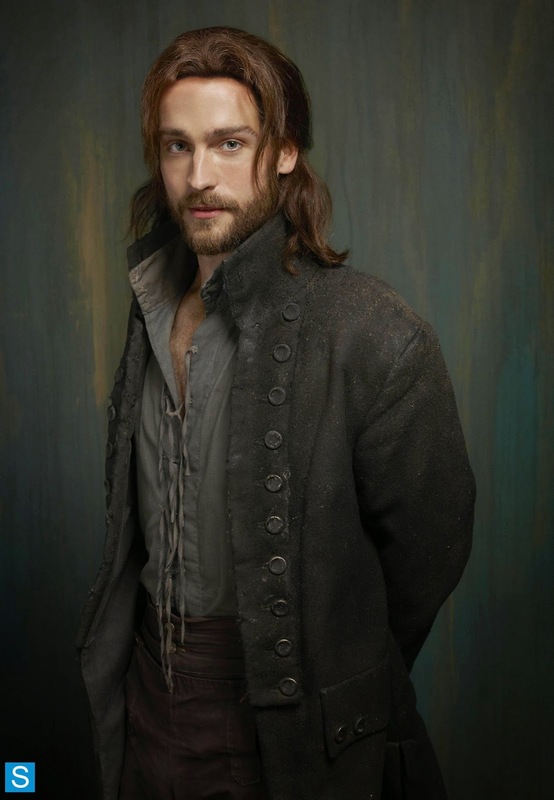 Then there was Tom Mison, the lead actor who plays Ichabod Crane. He is really tall, slim and very handsome. He was kind enough to wave at us. There was a lady with four little kids standing near me. They were so excited that he waved. I saw him a little while later as he walked past my car. I smiled and waived. He looked at me and smiled. He was wearing a baseball cap. He walked by a bunch of people, but nobody noticed him. Too funny! Across the street, I noticed these two fellas. I shouted and said I was going to take their photo too! Then I walked over to meet them. 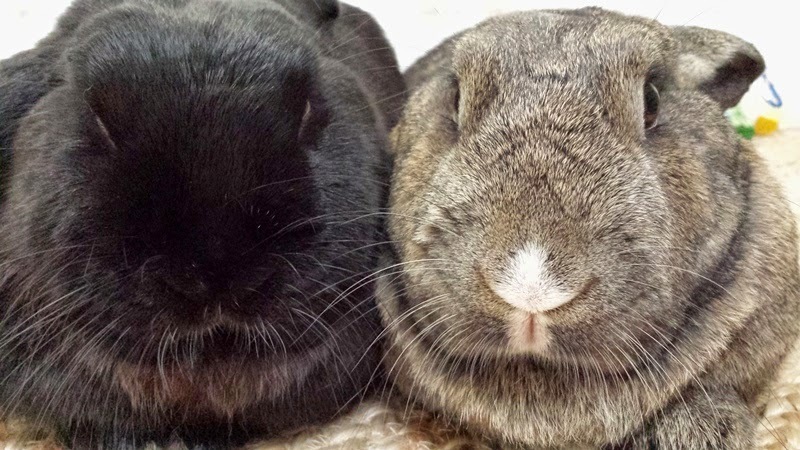 This is John (left) and Reggie (right). They work for an independent film crew that supports different production companies. They were so nice to take the time to chat with this curious little bunny lady. I was fascinated by all the production and behind the scenes activity that goes into making a show. I truly enjoyed our chat and Reggie gave me a big hug when I left. Thanks fellas! They had finished filming on this street and I asked a police officer if I could walk down and take some photos. This is the house they were filming in. Isn't it pretty? I love the trees too. Here are some props and another house they used for some scenes. It was so much fun being able to witness all of this in person. I can't wait to watch the season finale and see how they transform all this into TV magic. There are so many talented and creative people who bring everything together. Alas, I found out later that this will be the last time they film in NC. In fact, many production companies are leaving. Film agencies have been in NC forever. Wimington, my favorite place, is huge for the film industry with lots of TV shows coming from there. It seems it is all coming to an end. As stated on the local news, the NC Politicians have decided to end the tax incentives for filming, thus sending the film people to GA where their Politicians welcome the agencies with open arms and huge incentives. While I stood enjoying the activity of the filming, I looked around at all the people working. I looked at the bags people were carrying from local shops. I looked at the $100,000 worth of mulch that was spread on the street to create a scene and thought about the people who were not only paid to deliver and spread the mulch, but who would be employed to clean it up. 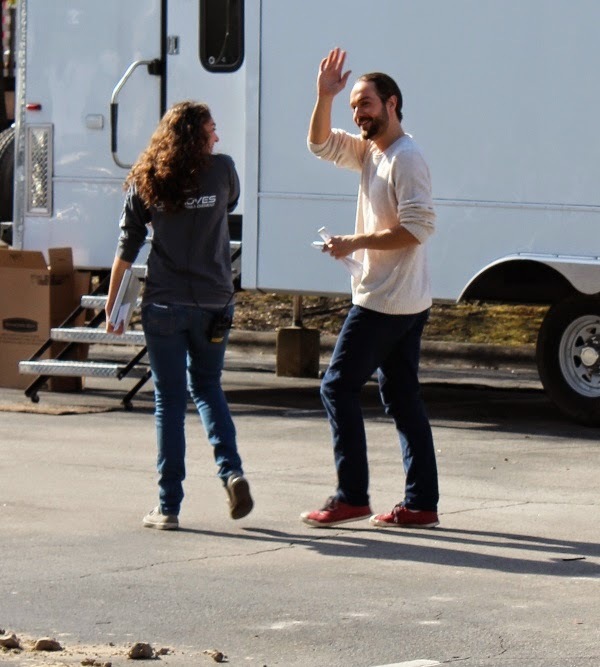 I looked at what a wonderful four days of income, not to mention excitement from folks who were selected to be extras, that this filming crew brought to the little town of New Bern. In 2013, the NC Politicians gave $61.2 million in tax credits to the film industry who brought in $268 million in direct spending and 19,000 jobs (to people who pay taxes). Now I'm no mathematician or economist by any means, but I can't seem to wrap my head around why our new Politicians would want to send over $206 million dollars to the state of GA and cause 19,000 (tax paying) people to lose their jobs. It's really sad and frankly, stupid. It's hard to believe that we are half way through January already. I have a feeling this year is going to go just as fast as last year. Many of my friends/customers have stated that they are wanting to make smaller projects this year. 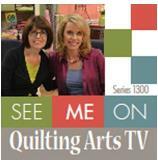 I was delighted to hear this as most of my new designs will be mini quilts or what I'm calling "Mini Fusions." These pieces are fun to make because they aren't overwhelming. 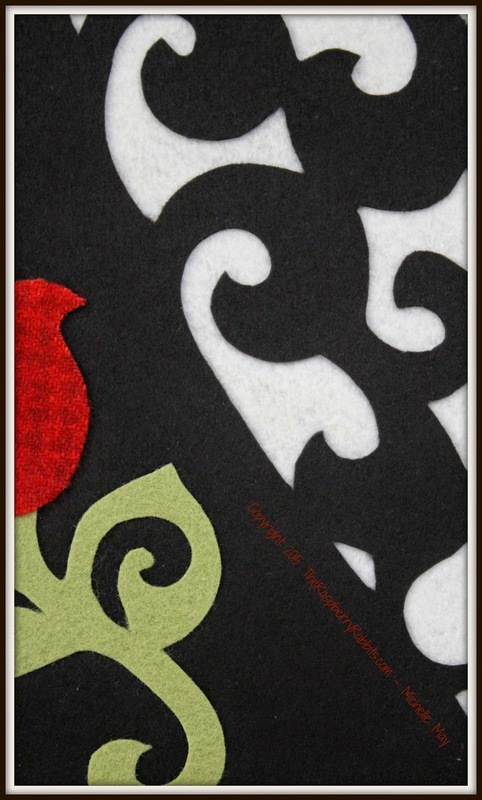 It doesn't take much time to create a beautiful piece of art which you can display on your wall, table or as a pillow. 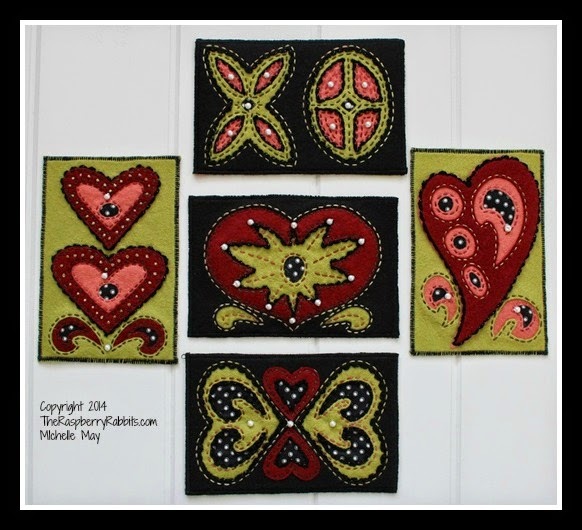 Speaking of small projects, my Postal Fusions Folk Art Valentines make wonderful gifts to send through the mail. 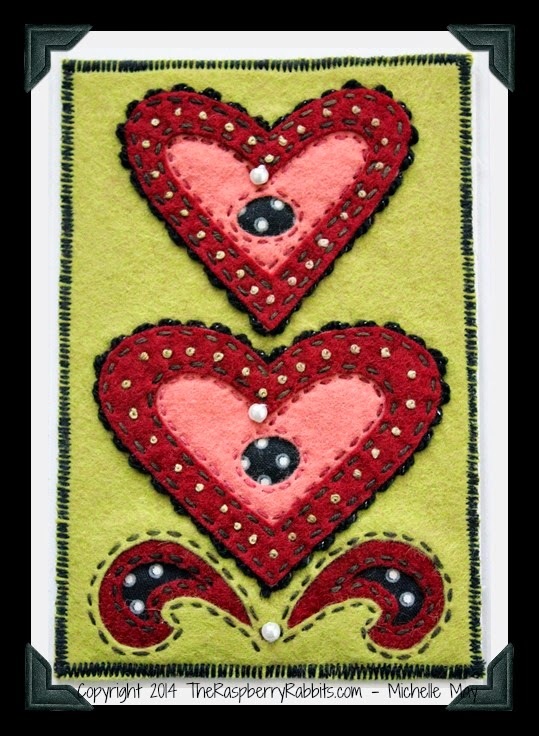 Each of the five 4" x 6" postcard uses scraps of wool and fabrics. You can send them through the mail in a clear envelope or a regular envelope if you like. and you can even frame them! The pattern for these is sold as a PDF download in my Craftsy Shop. 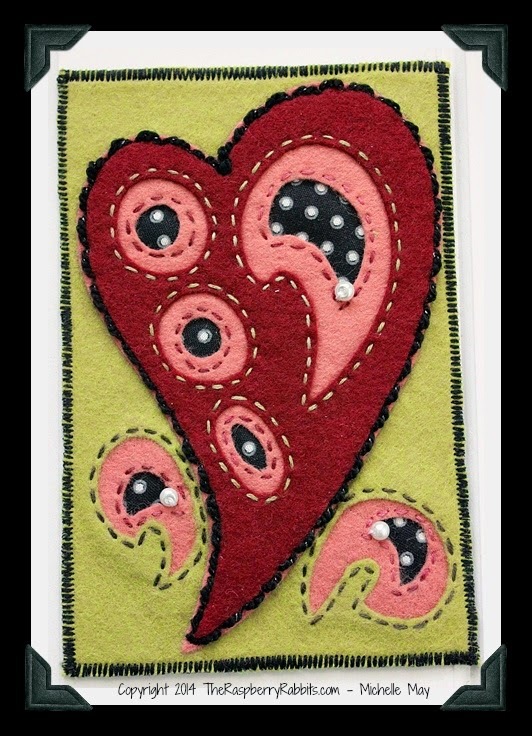 You can download and get to stitching right away. 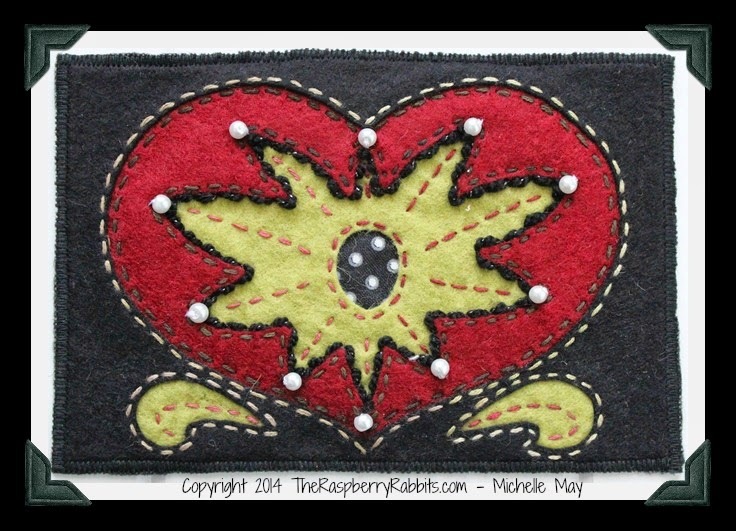 Oh, thank you for your kind comments on my stitching question last week. 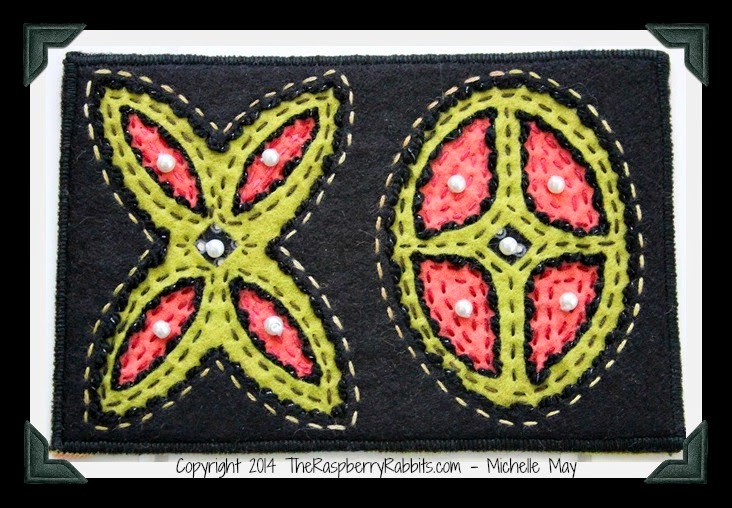 I have started stitching the project and can't wait to show it to you. You ever have one of those days when an idea just grabs you and won't let go? I have had an entire week of that. I'm not sure if it's because I'm having a "wild hare moment," or if I just get bored with the same look of things and have this desire to break out of the box and be different from everyone else. 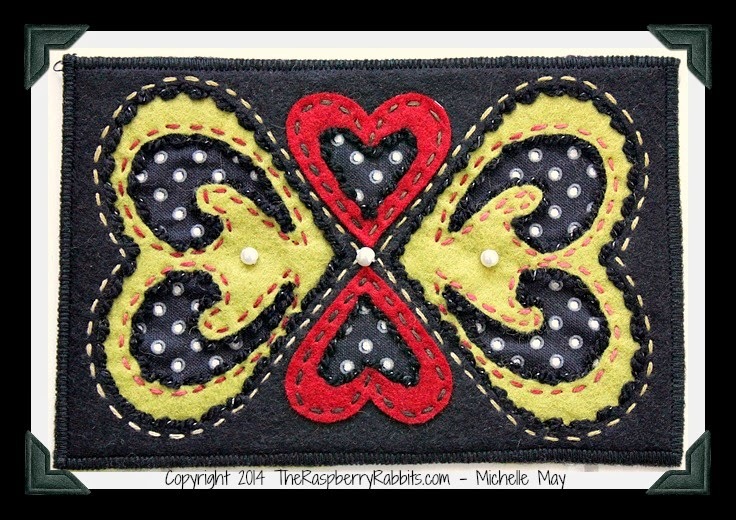 So here's a sneak peek of a new Folk Art Fusion design that is a totally the opposite of what I would normally create. My designs tend to be on the country side of things and this is definitely more modern. I would love to hear what you think of it. Should I be a rebel and start the stitching or just scrap it? Would it be something you would want to make or take a class on? We know what you did. You were naughty for two entire months weren't you? You ate lots of cakes and candies and pies. You ate too much of everything didn't you? Well now it's time to get back in shape and get healthy. Today we want to share a few simple things to help you stay fit and trim. Feel free to practice these at home. Please note, we are not responsible and cannot be held liable for injuries, mishaps or other things you might do to yourself. You're on your own. That being said, let's start with some simple stretches shall we? First, lift your leg, point your toe and stick it in your ear. Hold for a count of five. Please note, you may encounter ear wax. Remove your toe from your ear and place it on your chin. Hold for a count of five. This is also an excellent time to see if you removed ear wax from your ear. If so, you can just lick it off. What do you mean "eewwwww?" It's just ear wax. We all have it. I'm keeping it real people, keeping it real. Moving along. 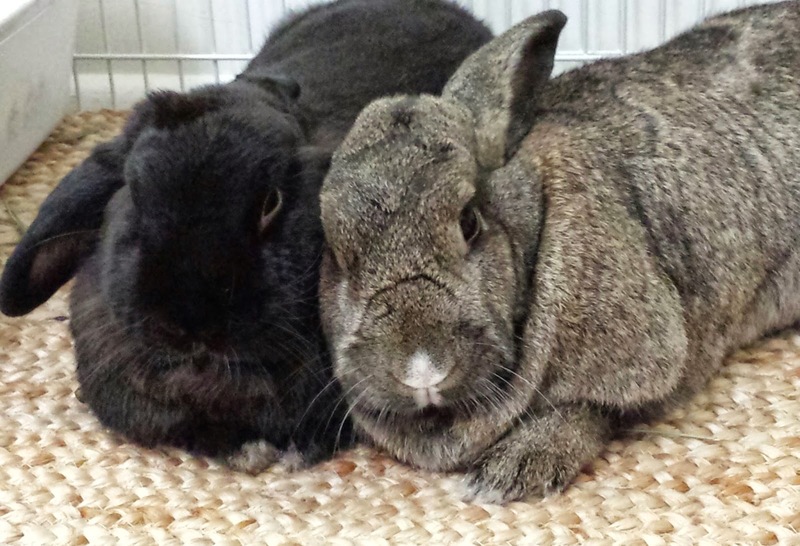 Now place your front feet on the hay box with your back feet slightly apart on another box. 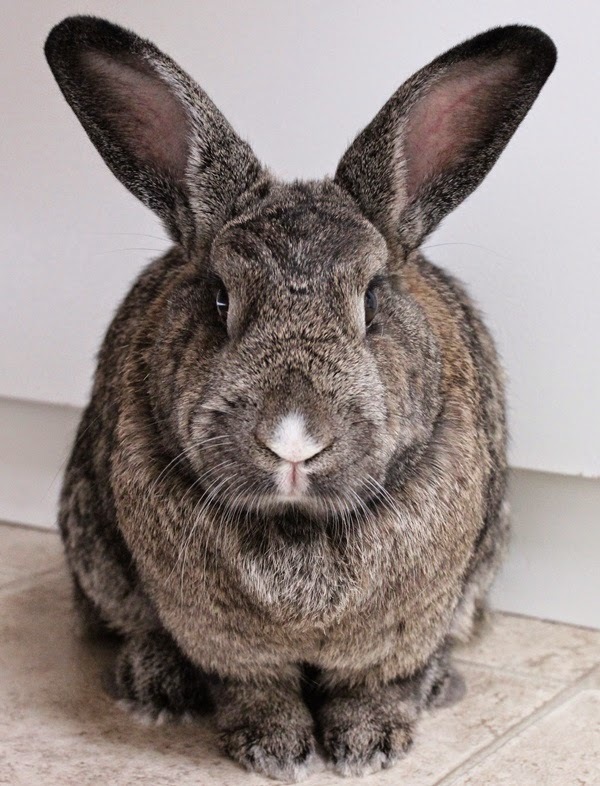 Push off the hay box with your front feet three times and then hop up on the hay box, or if you don't feel safe, simply hop back down to the floor. This next exercise is best with a buddy. Using your nose, shove the ball to your buddy. At this point, you may take a bite out of the ball before shoving it to your buddy. Now place the ball in the basket. You may take a bite of the basket as well. Ok, let's move on to some ear tai chi. Stand up and point your left ear to the ceiling while your right ear points to the floor. Now gently lay down and at the same time spread your ears apart in opposite directions. Turn your head to the left while raising your left ear up and lowering your right ear. Repeat this routine three times being mindful of your breath. This exercise is excellent to stretch your neck, head and get a side rub at the same time. You get the picture. Next, lay on the floor and cross your left legs under your right legs. Let your eyes roll to the back of your head and play dead for a few minutes. Speaking of playing dead, meditation is good for your busy mind. Meditate at least 15 minutes a day. It's also very important to follow a healthy diet. You need to eat lots of greens as you need the fiber. You may be tempted to eat processed cardboard carbohydrates, but you must resist. You have come too far to fall off the basket now. Now that you have had a good workout, it's time to cool down. Lay on your belly with your legs out to the back. Point your toes and stretch them as far as you can. At this point we also like a nice rub down. Take a well deserved break, but remember to drink plenty of water! We wish you all the best for a healthy new year.